does anyone know a source for the thermostat installed in the 850CSi oil filter housing? I'd like to fit an oil cooler to a non CSi and modify the oil filter housing but the thermostat is NA as a separate spare part. BMW wants me to purchase the entire unit which I'd like to avoid. Housing needs to grow a pair, complete with passage ways. Expect 27mm threads on that thermostat (probably, not). Sits on the line from the oil radiator, thus bypassing the filter, thus creating the pressure drop needed to detour. Deep dark special tool required for install/remove, so I can't examine any further. Unless I fab'd a tool. Last edited by Hyper; 04-08-2014 at 02:41 PM. The standard housing you are showing is an E38/M73 oil filter housing - at least over here in our area. The standard M70 housing looks like the one you're showing on the right side whereas it actually doesn't have the cooler ports. The upper one is prepared for the cooler hose but the lower one has no thread nor is it drilled through. But changing that is no major issue for a machine shop. The thermostat is actually located inside the port underneath the pressure switch. IMO the arrows on your picture are the wrong way around. Both ports are also marked V (=Vorlauf=feeder) and R (=Rücklauf=return). This V-port also needs to be machined for the OEM thermostat but also this is possible. What you call a thermo valve in the third picture has IMO nothing to do with temperature. This valve is open if no filter is installed and allowing the oil in the filter housing to be drained through the tube which is connected directly to the oil sump. It closes once a filter is inserted making sure that the housing is always filled with oil even with the engine/oil pump not running. Your opinion is good. Original pic corrected. Reminds me of being caught out over OT as found on a harmonic balancer. The housing shown is the late version, available to the e31 M60/62/73 in the gulf option, versus the earlier style shared with the e32. This particular one was pulled a couple years back from a race team in europe, if you can consider UK part of europe. 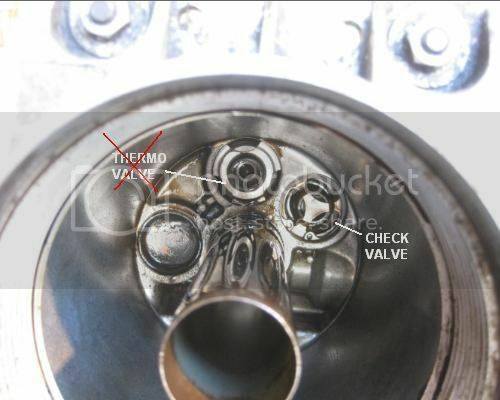 There is no other valve on this example but it may have been messed with by the race team. 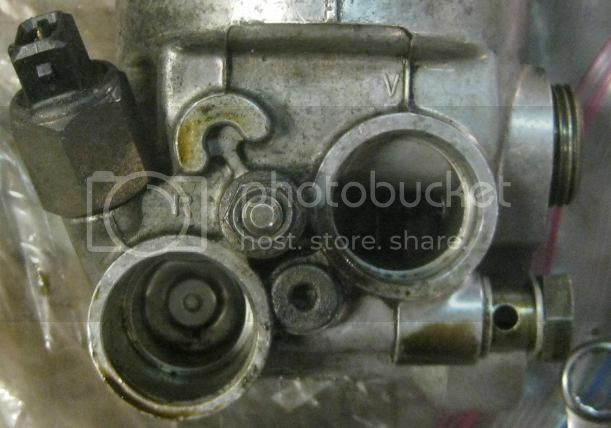 The actual temp valve is a wax actuator inside the return (left) hole on this pic, complete with a spring and circlip. problem is the valve is missing in this pic.. My 91 M70 has hot-climate option and it comes with the oil cooler and the same filter housing as in this picture. I have recently took the whole thing apart for restoration so I'm dead certain of that. Wokke I cant remember off the top of my head but I don't remember the actuator having any manufacturer marking on it, except the number 85 which is probably the temperature. You'll also need the plastic sleeve around it which is actually the valve. Again there's no marking on it that I can remember. the spring and circlip are easy. I'll be with the car in a couple of weeks and will check again for you as the filter is still empty and out of the car. In any case I think your best bet is to get a filter from a hot climate car. Think SE Asia, Gulf and Australia. I would look for you but all the older cars in HK junkyards are exported to ME and Africa, and Aussies generally charge 2-3x because the cars cost 2-3x to start with because of the tax man, still, pretty sure I can get this in Australia. PM me if you need it. Last edited by affa; 04-08-2014 at 02:14 PM. Below the picture of the entire thermostat assembly. It indeed has no manufacturer marking and the number on it doesn't help either. I tried various brands (Behr etc.) in combination with this number but no luck. I did find a very similar looking actuator offered by Sandtler Motorsport and ordered it to check if it might fit. The plastic sleeve would have to be manufactured, spring and circlip are as you say not a major issue. The non oil cooler housing needs some machining in the R port because the circlip groove isn't existing and the step the sleeve sits on is much higher so it has to be drilled. Again possible. IF I find an actuator that fits the rest should be nothing major. But it barely makes sense for just a single housing considering that time is money as well. AFAIK there is no thermostat in the reservoir, just the extra connections. Thanks, Tim! I am wondering if there is a thermostatically controlled valve in filter housing that opens valve for oil to circulate through the cooler. The easy access oil filter is mounted on the left inner fender. Features include large diameter hoses to insure ample oil flow and an anti-drain back valve. Thermostatic oil cooler control is located in the lower section. At a temperature threshold of 95°C, engine oil is directed to the external oil cooler for additional heat dissipation. So I can just change out the easy access oil filter (housing) from a model equipped with cooler, add lines, and cooler and have a OEM engine oil cooler? Lot of options out there but yes! The filter housing may still be available new. The only suggestion I have is to look for a compatible wax element in a coolant thermostat. The proverbial needle in a haystack. E31, E32, E38, E39, version p/n: 11 42 7 511 171 oil filter housing is identical except it has an 108deg.C internal thermostat. I installed the CSi oil filter housing on my 1997, 850 with the CSi oil cooler & lines. As companion upgrades I installed a 85deg.C coolant thermostat, 80/88deg.C fan switch and 105mm coolant pump pulley. On my 98, 740 which has the 105deg.C MAP thermostat, I installed the p/n: 11 42 7 511 171 oil filter housing that an 108deg.C internal thermostat. I got a new E38 OE oil cooler on eBay for $25.00..
OEM lines and other parts would be nice to use. And the hard lines would definitely be easier to route vs larger diameter rubber or braided hose. I sure would prefer the 85C thermostat but that may be too difficult to obtain. May be worth looking for the CSi housing before making any purchases. I ordered a new oil filter housing with hose fittings and several o-rings and the parts came in today. I bought the CSi housing with the 85C thermostat because it gets so hot here in S Texas. I already had the old 7 series cooler and hoses so I would like to use this cooler and have some new lines made up. Go to 8Tech for the info he has a good write-up on the oil cooler line upgrade. Thanks for the suggestion! I have been in touch with Gerry and I did find the thread. The fitting I plan to use to make up some custom lines is a 5/8" JIC male to 22x1.5 metric female straight swivel adapter. The female side has an oring on the tube that goes into the oil filter canister adapter.